Make this a sticky, so dont have to start one every round of fixtures? Can't see any of the bottom three winning. A draw for Fulham against Palace would be handy. Personally would prefer a Palace win. They won't be going down in my opinion. Better for Fulham to get as few points as possible. only a matter of time till spurs score, they are all over newcastle like it is the few mins. Palace are level on points with us, I don’t see them as being any safer than we are. The difference is that they are pretty much a 1 man team and if Zaha doesn’t turn up they don’t win. If we hadn’t made about 4 silly mistakes in a row, they wouldn’t have scored against us on Wednesday. They’re the kind of team that can easily lose 6 on the bounce. Each round of fixtures is different, similar to the build up, match and post match threads. People criticised Saints inability to breakdown Palace on Wednesday but looking at the Spurs Newcastle game you could see exactly the same happening. Newcastle had a bank of 5 and 4 and little room to create. In the end patience won the day. Everton down again, maybe worth an insurance bet on Silva being sacked. With the Puel situation, I reckon you could get good odds on Silva being sacked next. Quite why people go so gaga over him is a mystery. His greatest achievement in English Football is NEARLY keeping Hull up. 1 win in 11 games for Brighton. Cardiff 1 up already. FFS. But many on here aren't concerned about relegation. Absolutely. Nothing in his record to suggest that could happen. Nothing at all. what i didnt get was that a new striker coming in (apparently) hinged on Austin leaving. But didnt we actually SELL Gabbiadini? I wouldn't put it past Bournemouth fans to have cheered the goal tbh. Last edited by SuperSAINT; 02-02-2019 at 05:28 PM. FFS - Cardiff 2 Bmouth 0. Clyne having a mare second half. Played the guy onside for goal and now booked after being out sprinted. Niasse looks like a more useful version of Shane Long. Would like Cardiff to stay up, just not at our expense of course. Keep a close eye on Brighton, absolutely plummeting. Brighton now have some favorable games. Having thrown away a two goal lead against a **** poor Fulham side, I'm not sure any of those are favourable games other than Huddersfield. Well they've got 13 points from their last 15 games, so they may be okay, but they're in some pretty terrible form and were far far away from the bottom three at one point, now not so much. Watching MOTD pretty sure I've just seen three penalties given for handball in one day. That's got to be pretty rare in itself but I believe all three made life harder for Saints FFS. West Ham 7/1 seems over generous. 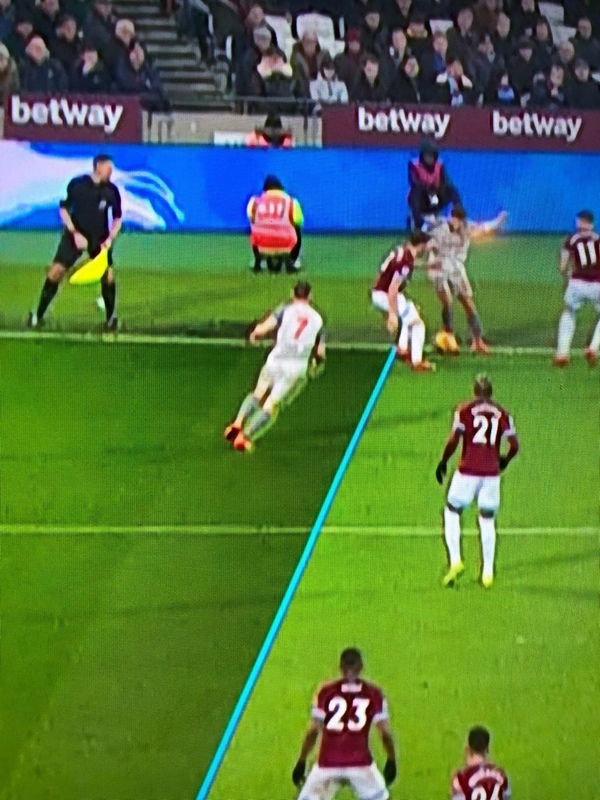 As always the officials doing their best to help Liverpool. Shocking decision. Way offside. What a fukkin assist by lallana. What a footballer. Most technically gifted player since Le Tissier. Well in fairness, the lino was a long way away!!!!!! Pellegríni will no doubt be a gent about it. Imagine the hysterical reaction if was the other way round. I dislike the Hammers quite a bit, but do hope that they win tonight. I fear it is already lost.